Now it’s happening. The Greeks are plundering their bank accounts emptying out super markets and gas stations over the weekend. Some Forex brokers notified to their traders that, due to the uncertainties on the referendum and the ongoing debt negotiations with Greece, a high volatility will be to be reckoned with. So they announced increasing margins for Euro-related pairs as well as restrictions of the order executions. Effective yesterday, the Greek Piraeus Bank and the Bank of Greece lost another 15-20% over the weekend nearing to the junk status. Premarket, the DAX is quoting just about 4% below its Friday closing price. I mean it might open at 11100-11050 on Monday. The current Sunday lows are at 10970. As far as I discern, such a low opening would mean the biggest opening gap of the last few years. In addition, the breaking news are spread over the air that now all the emergency reliefs for Greece are stopped… I see a present Sunday low in the Dow Jones at 17635 (Friday close at 17947 = -1,7%). However, while I’m writing these lines, Sunday is only just half over. Currently, by virtue of the Euro + Greece worries, I rather see very good buying chances growing up in the FDAX with a high near-term potential! For I think/suppose that the month of June delivered an extremely important correction low three weeks ago, perhaps the absolute price low of the whole correction already. Odds are however that due to the current political instability, a small lower correction low is in the wind for July. This can be bought! 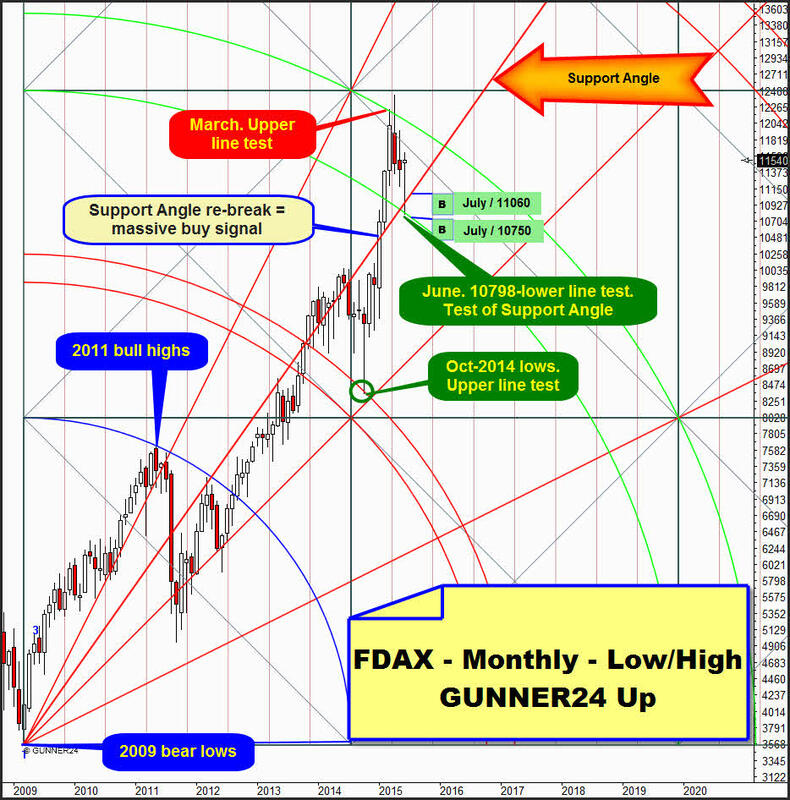 In this very Low/High GUNNER24 Up Setup applied for a very long term (measuring from the absolute bear low of the year 2009 to the absolute high of the year 2011) we see that the index at the June-2015 low tested/worked off exactly the support of the lower line of the 2nd double arc. A visible bounce starting from the June 2015 low ensued by return. So, the lower line of the 2nd provided good support developing rather impressing bouncing energy and being supposed to maintain this energy status for the month of July 2015 as well. In the June-low environment, simultaneously the Support Angle was tested back once more – likewise successfully. All in all, we ascertain that the 1st double arc as well as the 2nd double arc have enormous relevance for the index. The start of the last important rally in the monthly time frame took place at the successful pinpoint backtest of the upper line of the 1st double arc at the October 2014 lows. Then, the rally topped narrowly above the upper line of the 2nd resistance, after 7 months – the March-2015 highs touching precisely the upper line of the 2nd. This March high is extremely important, perhaps it is a more important resistance than the subsequent high of April, since the March-2015 close is the all-time closing high. Current signaling: The FDAX is showing some monthly closings between the lower and the upper lines of the 2nd. Certainly this means mid- and long-term resistance at this double arc. In the end, the 2nd double arc is likely to be taken in the course of the time and in trend direction! This again means that we have to go for it in case of deep corrections because this bull’s targets are still much higher. Please mind now the level of the lower line of the 2nd double arc support. For July 2015, it takes course at 10750. That’s where I’d buy, the possible small lower monthly low, mentioned above. 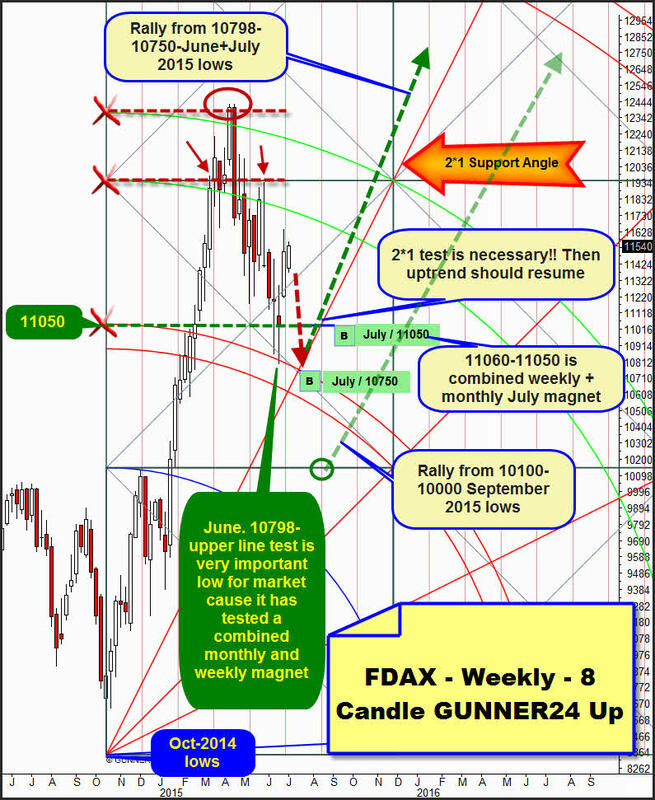 A further good buying price in 06/2015 is at the Support Angle = 11060 for July 2015! See here again the wonderfully exact tests of some important upper/lower double arc lines. The April ATH touched the upper line of the 2nd resistance. The June low bounced visibly from the strong lower line of the 1st support. ==> We assess that the 10798-June low worked off most exactly a support in the long-term as well as in the short-term 3 candle up = combined monthly support. As this combined support is an arc support, it keeps on existing for the month of July 2015, just in the next lower floor. At exactly 10750, furthermore the Rally Angle takes course that is anchored in the setup above. I strongly presume that July will demand a very first test of this Rally Angle! After this ensued test, the FDAX is technically supposed to go upwards vigorously. Current signaling of this up setup: ==> It is just as the low/high setup analyzed at the beginning! The March 2015 close is within the lines of the 2nd double arc lines. So we have a strong indication for the next higher double arc to be willing to be reached in trend direction ==> The lower line of the 3rd is at 13400 in summer 2016. The 13400 is possible main buy target for the monthly long position discussed today! Important for the announced long-entry is the fact that the 10750 support IS ONLY VALID FOR JULY 2015. I mean, the timing for the entry is enormously important: ==> Only if the FDAX reaches the 10750 in July, just in this case one should buy. 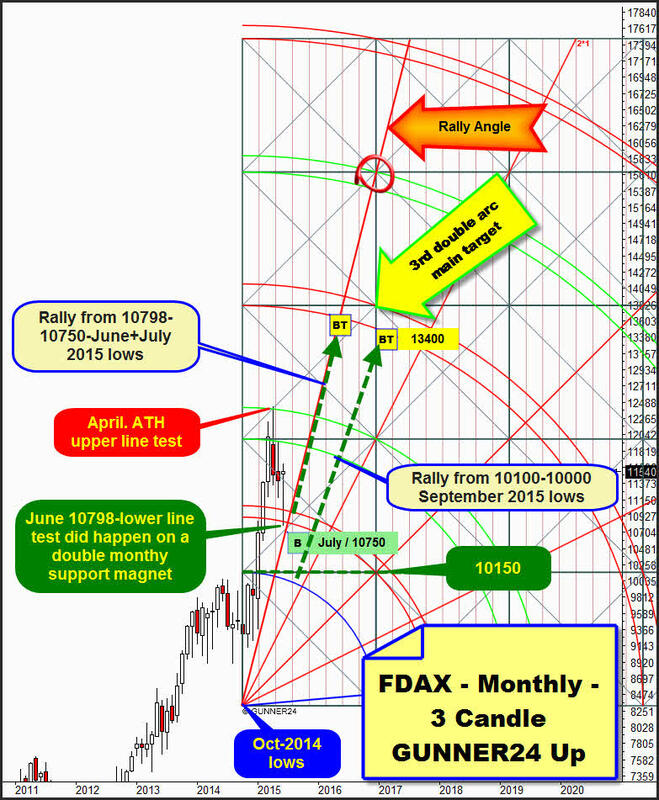 For, if June falls below the 10750 during the last two trading days respectively closes near this mark or below it, without any fail the FDAX should/would have to fall down to the 10100-10000 – until September 2015 will test back the round natural 10000… In such a case, the next strong rally in the present bull market would not be able to start before the first, probably successful, backtest of the first square line support. Above, for closing today’s issue, the currently valid weekly up setup. It starts at the important Oct-2014 lows. I ask you first to direct your principal attention newly to the yet reached 10798-June lows. A marvelous first backtest into the upper line of the 1st double arc support, followed by a strong bounce. The candle at the June lows shows a very long lower shadow. This means strong buying interest at this combined double monthly and weekly support magnet. In the weekly time frame in the setup above, the 2*1 Support Angle intersects the upper line of the first double arc exactly at 10750 the week after next. Thus, there is not only combined monthly, but also combined weekly support there. ==> So to speak, a quadruple support is there at 10750. Technically, this means nearly unbreakable support for the FDAX!! I mean, the 2*1 Support Angle is an important starting and possible changing point for the market. The 2*1 Support Angle compellingly HAS TO be reached and thereby to be worked off in this correction. Not before that, a new strong rally leg may respectively can begin! This changing feature will only apply however if it is not worked off next week already. The 2*1 Support Angle takes course at 10620 pts. for next week after all. Such a price, far below the current June lows permits the FDAX to slip through unchecked to the round + natural 10000 magnet till September 2015! Furthermore interesting is that also the weekly time frame at 11050 puts out strong GUNNER24 Support. Exactly at 11050, the support horizontal is forming, starting from the intersection point of the upper line of the 1st double arc with the starting point of the setup. At the top of the issue within monthly Low/High GUNNER24 Up Setup, the important and strong Support Angle for July 2015 resides at 11060! ==> Thereby, the area between 11050 and 11060 likewise means also very strong combined weekly and monthly support! ==> I presume that tomorrow, on Monday, during the official trading times this 11050-11060 support area will be tested successfully being produced there a first important weekly low and for the rest of the week the index bouncing rel. weakly upwards then in order to test successively the important July-10750 quadruple support magnet in the course of the week after next! Important announcement: This is the last issue before the summer vacancies. For the first time within 2 years, I am taking 1 week off to recharge myself. Thereby, the coming two Sunday issues of the free GUNNER24 Forecasts are omitted. Correspondingly, the next free GUNNER24 Forecasts will be issued on July 19, 2015!